A collection of apps for interacting with sound. Touchscreens have opened up a host of possibilities for making unusual musical compositions. You might use these apps and tools on their own; you might compose music for dance movements; or you could use them to respond to another artwork using sound. They offer starting points for thinking about patterns and repetition, and much potential for talk and collaboration as children ask ‘what if’ questions whilst they explore a tool’s music-making potential. SoundPrism makes your musical inventions sound good straight away by only playing notes that are in key with each other. You can explore melodies, tone and chord patterns through a choice of 5 soundpacks, giving a good range of options. Mixtikl 5 Free is a generative music maker which gives you control over the output as you customise sounds, effects, musical parts and even add your own words. You can combine loops to create soundscapes out of the original 12 tracks or you can add your own. The message and display settings mean that you could write haiku poems that display text along with your music or you could create a composition that combines sound, a visual display and text in response to an artwork. 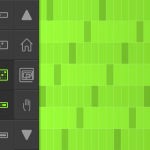 BeatEvolve Free is a music sequencer based around a 16×16 beat grid. It offers a way to visualise musical patterns and watch how they evolve. You can add layers choosing from piano, harpsichord, electric piano and drumkit, and then flip, shift and rotate the patterns and adjust the tempo to produce your riffs. If you are online rather than on an iPad you could try iNudge, which lets you play with a matrix of sound patterns in a similar way. Music Ball by Acoustic World is a very simple sound toy that creates tranquil chiming sounds as colourfall balls interact. You can play in landscape or portrait mode and create complex patterns by tilting the screen. Try the online tool BallDroppings for a similar experience. Caelestis is a free sample-based generative music app that creates sounds with bouncing balls inside ‘rooms’ that contain different sounds. Balls can be thrown around inside these rooms, generating notes when they collide with the sides. You can spin the rooms, control pitch and speed, and explore 30 different sound samples in tuned, abstract or percussive categories, providing many creative possibilities.